Learn how to practice piano well and you will discover the secret to playing the piano. Learn to practice and to love your practicing, and success is yours. 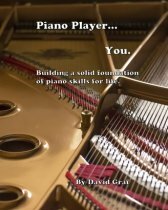 If you want a thorough understanding of what and how you can effectively practice every time you sit at the piano to work, you may want to consider the e-book: Piano Player... You (see image and link below). Chapter 2 of this book covers the topic of practice in very specific, easy-to-understand detail. A brief summary follows here, but for the complete plan... consider getting the book. For most amateur pianists, the biggest obstacle to development is not knowing how to practice. With a high quality daily routine of consistent and effective practice, applied over a period of years, anyone can develop into a confident and competent piano player, capable of playing whatever they want and with the skills to freely express themselves at the piano. The following practice methods are highly effective and enjoyable in that they produce results and they offer a pianist a solid plan for how to practice piano everyday. The following method shows how to practice piano using the metronome. -Work just one phrase, or passage, at a time. Start with a very slow and easy tempo. -Work hand separately, first (if both hands are playing simultaneously in the exercise). -Once you feel confident mastery of each individual phrase/passage, move the tempo up a couple of notches and repeat the process. -Continue working at faster and faster tempos until you start to feel challenged beyond your comfort zone. -If you are working on a long exercise, or etude, work on individual passages from slow to fast, and then start stringing them together at slow-to-fast tempos. -Start with short links, mastering the notes and the rhythm for each link. Use the metronome to help keep it even and steady, starting at a slow and easy tempo. -Expand the length of the links (from 1-beat links to 2-beat links, or from 2-beat links to 4-beat links, etc…), still at the slow and easy tempo. -Keep lengthening the links until you are playing the entire passage, phrase, or scale with no stops, at the slow and easy tempo. -With each phrase/passage, repeat this process over and over, gradually working up to faster and faster tempos on the metronome. -Decide what kind of groupings you are going to use: groups of 3’s (best with triplets), 4’s (best with eighths and 16ths), or even 6’s (good with triplets, or eighths in compound meter <6/8-time>). -Make sure that the notes in between the pauses are fast (eventually) and even, and that the hands are exactly together. -Use the pauses (which can be as long as you want them to be, but not too short) to think ahead for the next group of notes, as well as to remind your arms and shoulders to relax. -After playing all of the rhythmic variation once or twice, try playing the rhythm as it should be (with all even 16ths, etc…) and you should find that it seems much easier now. 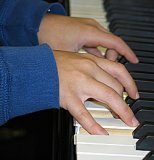 To begin learning how to practice piano music reading, make sure you are working on music that is at your reading level: music reading skills will always be 1 or 2 levels below your actual playing ability. (See Chapter 6 of Piano Player...You.) Sightreading skills are usually 2 or 3 levels below your playing ability, and 1 or 2 levels below your basic reading ability. -Divide the music into phrases/passages. The great majority of western music compositions come in 4-measure phrases. -Work on just one phrase at a time, overlapping into the next phrase by at least one beat (thus, linking the two phrases together). -Play the phrase with just the right hand (or left; it does not matter which hand goes first), slowly. Count the rhythm out loud (especially if you are specifically working on your reading skills), and keep your eyes on the music. Try not to look at your hands at all (big jumps could be the exception, though not necessarily). -Repeat the phrase as many times as it takes to become familiar and comfortable with the notes, rhythms, and fingerings. -Repeat the same process on the same phrase with the left hand. -Once you are proficient on the phrase with each hand separately, repeat the process with both hands. This may require you to go slower, as it is usually a bit more difficult. -Repeat the entire process with every phrase until you know and can play them all. Every time you complete the process for a phrase, play it together with the one(s) you have already worked. -By the second or third time you practice a piece this way, you should include the metronome for all of it (go slow enough and you may be able to use metronome from the beginning). Start at easy tempos and work your way up the dial until faster tempos are just as easy. As you learn how to practice piano music reading, your reading skills will grow and your love of reading music will grow! The following practice method will help you simultaneously learn and memorize a piece of music at the piano. -Divide phrases into two-measure-links, or even one-measure-links. For memorizing music, it is best to start with small links. The higher the complexity of the music, the smaller the links should be. (I’ve even had to memorize in one-beat-links, pieces by Bach and Rachmaninoff.) I like to just draw straight vertical lines through the music to divide phrases into chunks. -Figure out the notes, rhythms, and fingerings for the right hand on the first small (let’s say 2-measures) link. Play the right hand part slowly up to and including the first beat of the next link. -Repeat it over and over until you know it and can play it by memory, looking at the keys. Having the visual image of the music on the keys is helpful, so don’t close your eyes, or look off into space. -Figure out the notes, rhythms, and fingerings for the left hand on the same link. Play the left hand part slowly up to and including the first beat of the next link. -Repeat it over and over until you know it and can play it by memory, looking at the keys. -Once this first link is memorized and playable with each hand separately, play the hands together slowly until you have played it perfectly at least 3 times (with more advanced music, try to get at least 5-10 perfects), by memory. -Repeat the process for the next link. -Once you have all the links of a phrase/passage learned and memorized and playable at a slow speed, play the entire phrase, stopping on the first note of each link. -Repeat the process phrase by phrase, passage by passage, until you know the entire piece. -Day by day, it is important to maintain the phrases you already have learned by continuing to practice each phrase in links, right hand, left hand, both. Thus, you will find that you really can only learn one or two new phrases each day, while at the same time maintaining previously-learned phrases. -Use the metronome with your links practice to push the tempo up to the level you would want for performance. -When working in links, make sure you include musical elements: musical shaping, dynamics, articulation. -Practicing in links to learn and memorize a piece, and to continue preparing the piece for performance, will produce a confident and free playing of the music, with fewer mistakes and virtually no memory slips. Also, pieces learned in this fashion will last longer in your memory and be more readily re-learnable. The above described practice routine can be used on piano pieces from the beginning levels all the way up to the most advanced. I have my students learning and memorizing music from Martha Mier’s “Hamster Chase” to Beethoven’s Waldstein Sonata using these methods, and they all achieve performance level memorization with tremendous confidence. They also learn to love practicing, seeing how it produces such great results. Some people are simply interested in the academic side of piano playing. If that is you, music theory is the way to go. Wikipedia's Music Theory is pretty awesome. Return from "How To Practice Piano" to "How To Play Piano"